Please note: these settings are only available at league level. FE settings can be set at the league and competition level. If it’s not set at the comp level then the comp inherits the league configuration, pretty simple. 1. Click the Cog and then Settings. 2. Once you have chosen your competition - click the Cog and then Finals Eligibility Settings. Please note: this report is only currently available for Basketball, Touch Football and Rugby League users, other sports usually use the Player Comp Stats report for the same purpose. All the info you need to know is available in the Finals Eligibility report, which shows the number of games played and required to qualify for each player. 1.Click Reports in the top menu. 3. 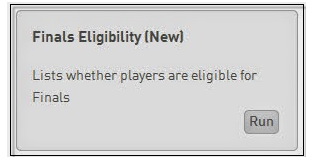 Select the Finals Eligibility (New) report and click Run. If this report is not up to date you may need to rebuild your comp stats.